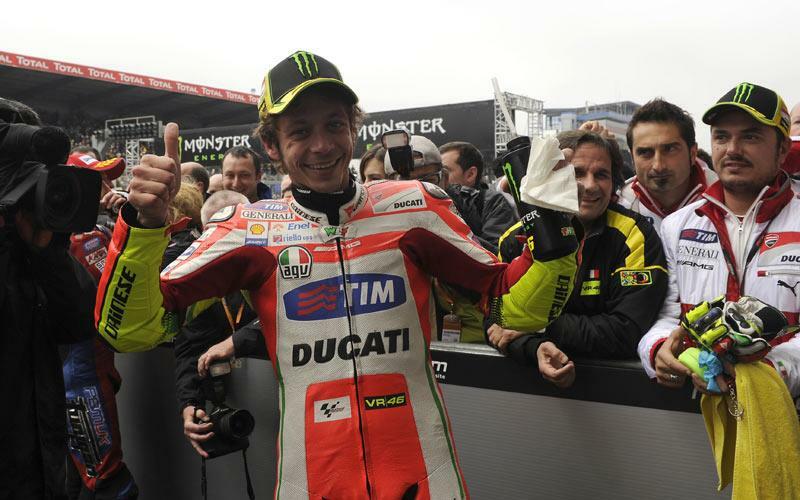 Valentino Rossi came out on top of a captivating late battle with Honda rival Casey Stoner to secure second place and his best Ducati finish in yesterday’s rain-hit French Grand Prix at Le Mans. Capitalising on the Ducati’s competitiveness in wet conditions, the 33-year-old was challenging for the podium throughout the 28-lap race having earlier been locked in a thrilling duel for third with Monster Yamaha Tech 3 duo Andrea Dovizioso and Cal Crutchlow. With Dovizioso and Crutchlow both crashing out while trying to stay with Rossi, he was then pitched into a rare scrap with Stoner’s Repsol Honda. Stoner was struggling to maintain his speed with his rear Bridgestone tyre overheating as the rain eased and a brilliant battle with Rossi then ensued. They exchanged several overtakes as the race reached an exciting climax but Stoner’s dogged resistance was ended on the last lap. The fight reminded fans of what they had been missing with Rossi unable to replicate yesterday’s form in the dry while still handcuffed by Ducati’s long-standing understeer and aggressive power delivery issues. It was only Rossi’s second podium in 21 races for Ducati and he almost celebrated it like a win. But the nine-times world champion is well aware that the conditions were a great leveller and until the GP12 Desmosedici improves in the dry, finishing inside the top six is going to be a big ask. He was going to savour the moment in Le Mans though, which was his best result since he was second in Estoril back in October, 2010. He said: “For sure when you want the rain then usually you are in the s**t but I know I have a special chance to fight for the podium. I tried to be quiet and concentrated from the beginning and I made a good start. "I felt good with the bike and usually the Ducati always gives a good feeling on the wet track. "I was behind Casey and Jorge (Lorenzo) was in front but not so far and we take some advantage from the guys behind but then I had a problem with the helmet. I have fog inside. It is a new helmet but never gives me a problem before during the practice. "To try and open the visor to bring some air inside I lose three or four seconds to Casey and the two Tech 3 Yamahas arrived to me. But when I fixed this problem I was behind Cal and Andrea but I had a very good pace, especially because I have very good traction on the rear and I can exit the corner in a good way. "I overtake both of them and continued to push but Andrea came with me and I had to give 100% in the last 10 laps and that meant we arrived to Casey and it was another great battle and I'm happy because it is the best result with the Ducati. The challenge now for Ducati is to give Rossi a bike that will let him battle for the podium in the dry. The latest leg of that long journey starts in Mugello this week when he tests a range of new electronics aimed at taming the aggressive power delivery. He added: “From Portugal we fix a good base where we can work in a good way and this weekend was the best qualifying for us and also in the dry we were not so bad. For more from Rossi and full coverage of the French Grand Prix, see the May 23 issue of Motor Cycle News.